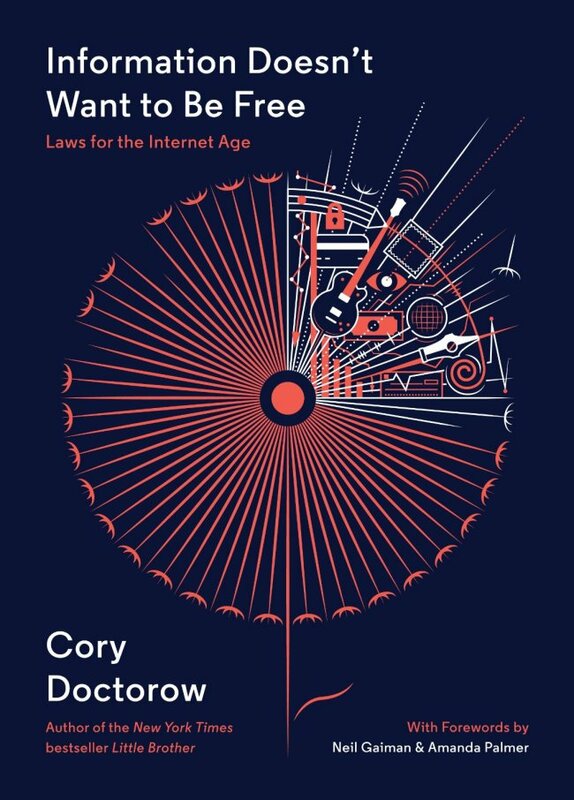 Cory Doctorow, who has given away his creative and intellectual work on the Internet for many years, has now published a book with his rationale for doing so. It seems like a sweet incongruity: Doctorow’s manifesto, “Information Doesn’t Want to Be Free: Laws for the Internet Age,” comes from McSweeney’s, the throwback hipster publisher of beautiful printed books. But the hardworking Doctorow takes advantage of all distribution channels available to him, from self-released audiobooks of his work (narrated by Wil Wheaton) to publishing his novels for adults (“Eastern Standard Tribe”) and teens (“Little Brother,” “Homeland”) through Tor, the biggest brand name in written science-fiction. Doctorow vigorously opposes third-party digital locks, such as DRM or DVD region locks, that restrict a user’s ability to experience a creator‘s work. “Digital locks are roach motels: copyrighted works check in, but they don’t check out. Creators and investors lose control of their business ― they become commodity suppliers for a distribution channel that calls all the shots. Anti-circumvention isn’t copyright protection, it’s middleman protection.” Middleman tools, Doctorow reminds us, led to the Orwellian nightmare of Amazon remotely deleting copies of George Orwell‘s novels from the Kindles of unsuspecting customers who had purchased them in good faith. As for his second law, Doctorow has long espoused the philosophy in publisher Tim O’Reilly’s statement: For most authors, the problem isn’t piracy; it’s obscurity. Like many 21st-century creators, Doctorow relishes being able to release his work online without intermediaries. Unlike some of the starry-eyed, he doesn’t think putting work online will automatically make him rich, or even necessarily earn him a living. “Nearly everything that nearly everyone tries to get rich from a career in the arts fails,” he writes. But the Internet gives creators a chance to become known, and thus to attract an audience.